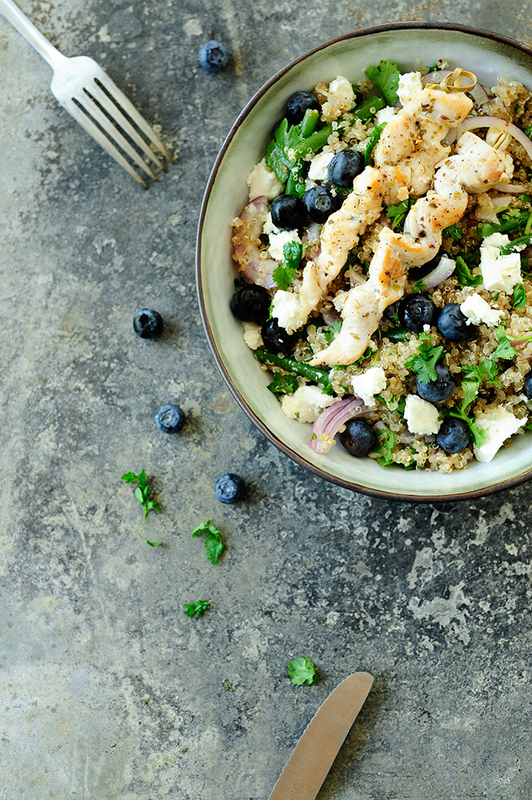 TIP: If you love quinoa and would like to know all the health benefits of this unique grain. Check out a great article from Helen Nichols on why we should eat this superfood. Cut the chicken breast into thin strips, thread chicken strips onto skewers. Marinate in olive oil, chopped garlic, oregano, salt and pepper. Let stand for an hour in the fridge. Then bake them in a hot grill pan with olive oil. In a saucepan, boil water with the bouillon cube and cook the quinoa until tender. Rinse beans, remove the stalks and cut into small pieces. Add to the boiling quinoa and cook for 5 minutes more. Drain and rinse under cold water. Then pour into a large bowl. Peel the onion and cut into thin slices. 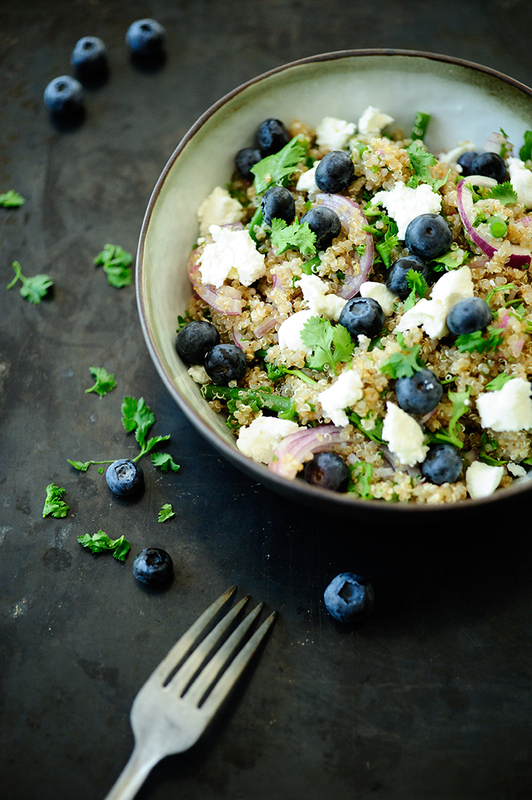 Chop the parsley and coriander and add to the quinoa together with the blueberries and onions. Decorate with the sheep cheese. In a separate bowl, mix the oil with honey and vinegar. Peel the garlic and squeeze out. Peel and chop the shallots and add to the quinoa bowl. Season with salt and plenty of black pepper. Pour over the salad and mix. Serve vegetarian or with the grilled chicken. Enjoy! Lieve ania, net deze nieuwe site ontdekt met al mijn favoriete recepten van jou, geweldig! Veel succes met alles en ik blijf je volgen vanaf nu. Hopelijk tot snel weer! !